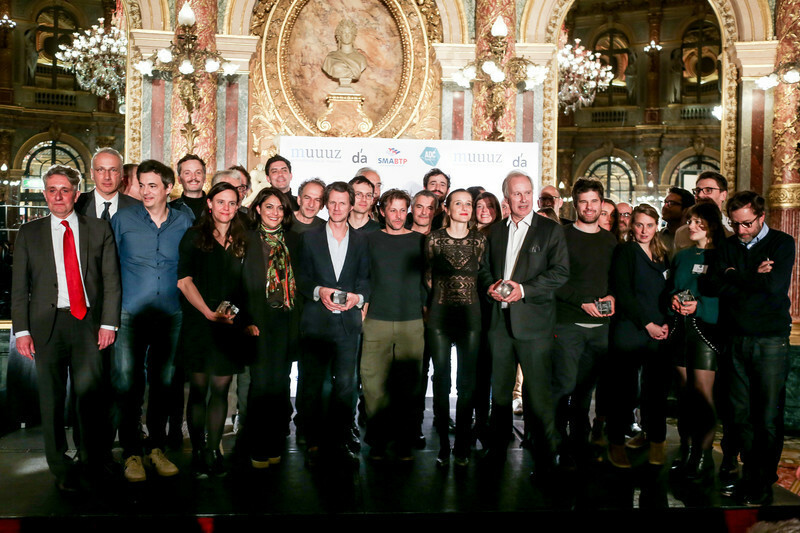 Centre d’expertise sur l’aluminium (CeAl) and Alcoa Innovation proudly announce the names of the five finalist firms in a design competition dubbed Architecture and community commitment: A tale of aluminum. 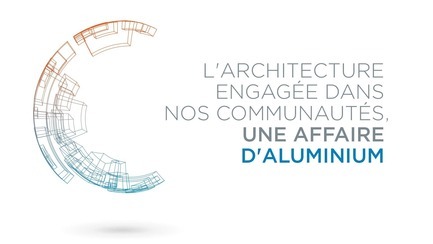 Launched last November in cooperation with Association des Architectes en pratique privée du Québec (AAPPQ) and backed by funding from the Ministry of Economy, Science and Innovation (MESI), the competition seeks to promote the innovative use of aluminum in the building sector. 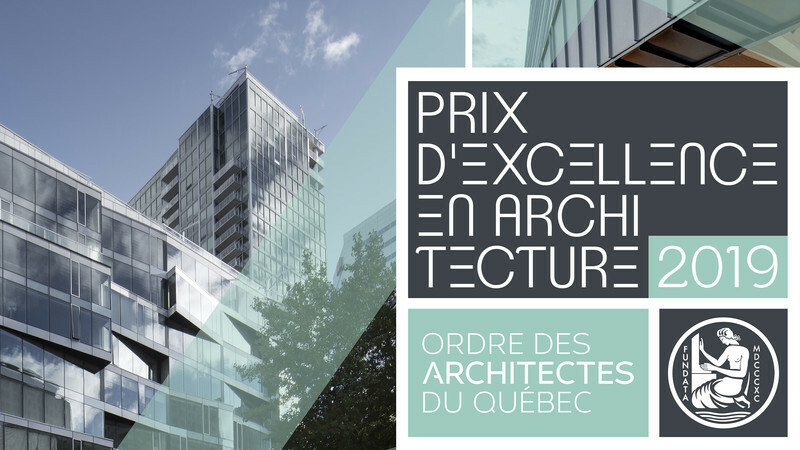 Upon deliberation, the panel of judges have selected five projects by architects, members of AAPPQ, which advocate the discriminating use of aluminum in sustainable, mobile or permanent architectural spaces of less than 120 square metres in area. 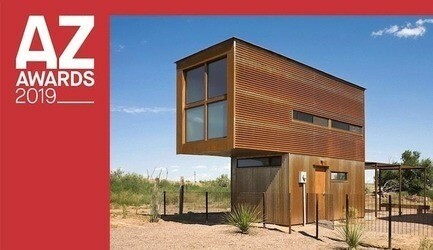 “We received many promising submissions providing for the expanded use of aluminum. 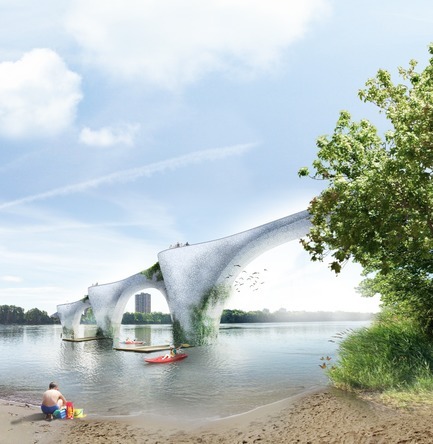 While some featured variations on current uses, others imagined new sustainable, structuring avenues for employing aluminum, a material known for a multiplicity of attributes,” underscored David Prudhomme, Director of CeAl. 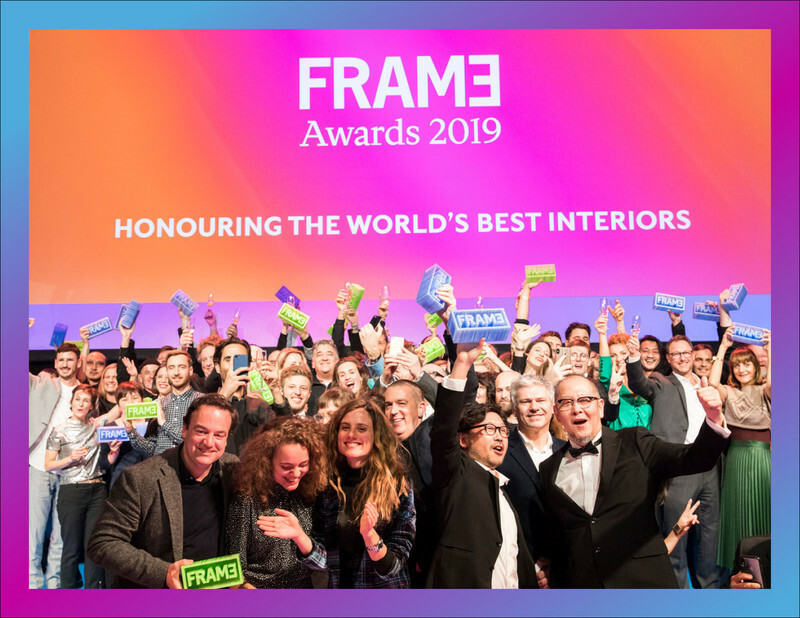 “Imagining architectural proposals for new, innovative uses of aluminum represented a challenge of substance for architects, one to which they responded with creativity!” Anne Carrier, President of AAPPQ and member of the panel of judges went on to say. 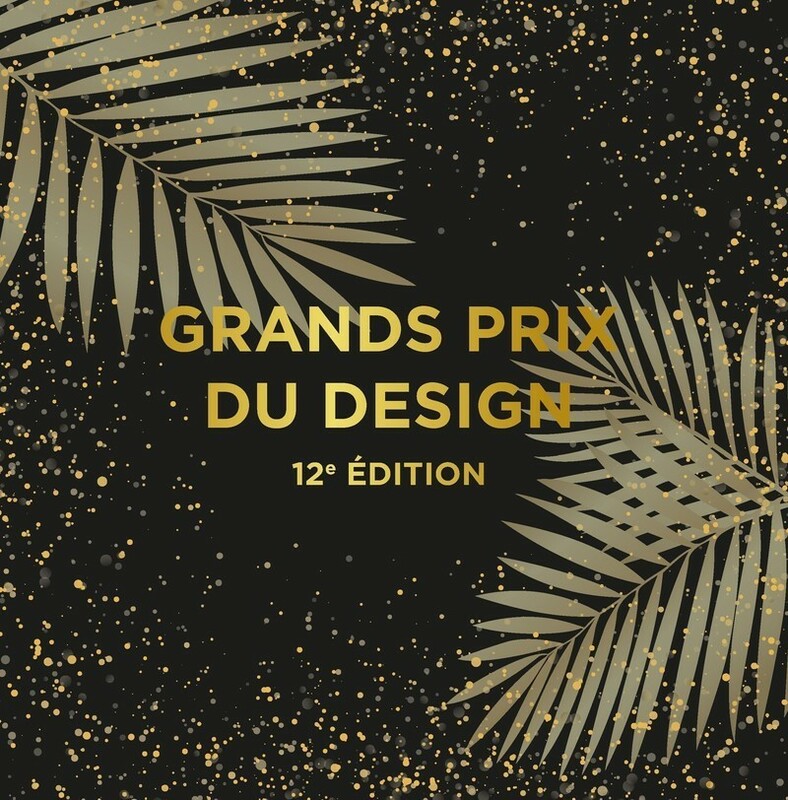 Design competition concepts were presented anonymously and graded based on novelty, functionality, quality (formal and ecological), added value for society and, of course, the manner in which they promote aluminum. 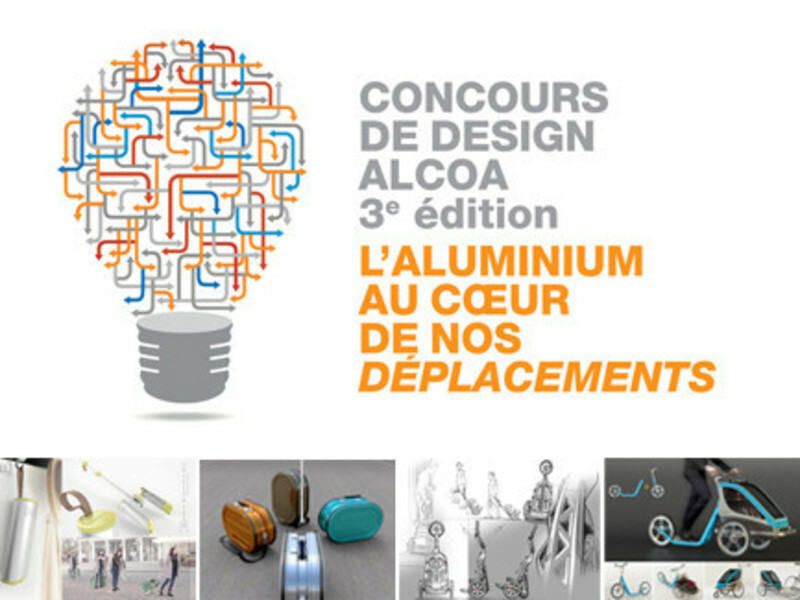 François Racine, President of Alcoa Innovation, had only praise for the work of the five finalists who showcased the versatility, lightness, malleability and recyclability of aluminum, a metal the virtues of which remain little known and underused in construction. “The government is delighted to learn of the unveiling of the names of the five finalists. These firms articulate Québec expertise and innovation in promoting and showcasing aluminum. We indeed rely on initiatives such as this competition to ensure that we meet the goals set out in the Québec Aluminum Development Strategy, goals intended to stimulate industrial growth in Québec, while expanding our presence on the international stage,” underscored Dominique Anglade, Deputy Premier, Minister of Economy, Science and Innovation, and minister responsible for Digital Strategy. 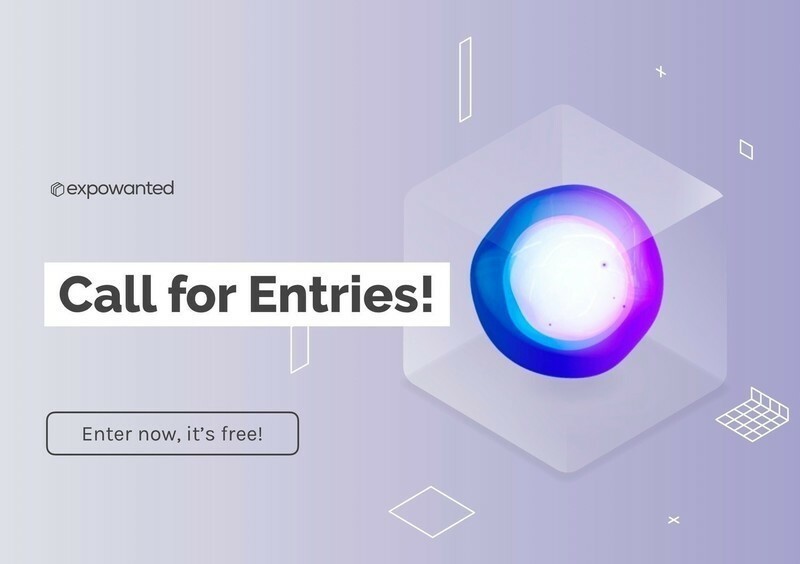 Upon close of the competition, CeAl and Alcoa Innovation will pay out a total of $50,000 in prize money to be distributed as follows: $25,000 to be shared among the five finalists, $15,000 to the recipient of the Grand Prize and $10,000 to the winner of the People’s Choice Award. In addition, grand prize and people’s choice winners will each receive expert assistance valued at $5000 from Alcoa Innovation. The same two top teams will enjoy added exposure through competition sponsors and the AAPPQ network. Grand Prize and People’s Choice winners will be announced on June 14th at the annual AAPPQ cocktail and posted on each of the Alcoa Innovation and CeAl websites. Constellations, imagined by Groupe A / Annexe U (Érick Rivard, Marie-Noël Chouinard, Maxime Rochette and Keven Ross), advocates the creation of new public spaces. Some are enveloping and introverted, while others are open to the outside world, but all intend to spur user delight. Located in former parking lots or erected adjacent to public spaces, these new covered satellite spaces would house social, cultural and sporting activities designed to showcase the vibrancy of life in the city. The structure entails the use of two large sheets of anodized aluminum which unfold to create an inviting shelter. The first rises up to form seating and the enclosure proper, while the second - boasting a bright, gloss finish - floats above the space and folds down to settle gently at ground level. 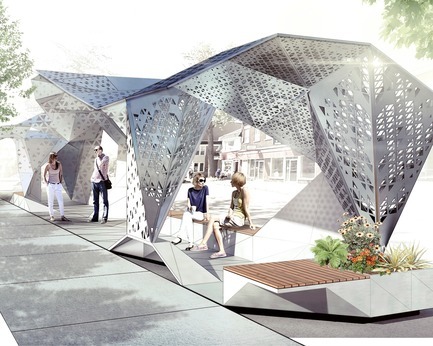 Perforated by hundreds of triangles, the aluminum canopy provides for an interplay of light and shadow designed to reproduce the effects of the sunlit sky by day and starlit sky by night. Rural and periurban areas rarely feature physical venues where farmers and local consumers can gather. The Rural Hub, a project by Mercier Pfalzgraf Architectes Inc. (Lino Gomes Alves, Julien Hébert, Zola Bilombo and Alexandre Dufour) seeks to bridge the divide by providing for a gathering place in which to celebrate the local terroir. Accordingly, the designers revived a familiar architectural shape symbolic of rural country scapes across Québec, namely that of the covered bridge. 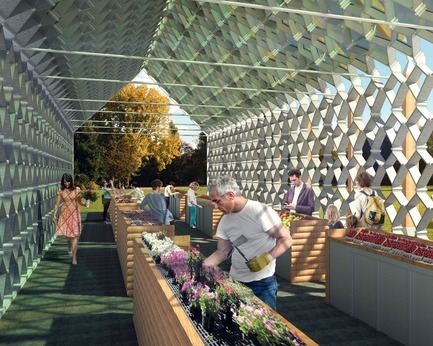 To honour the bridge analogy, the concept includes a structure comprising structural wooden porticos joined by aluminum connectors and overlaid with a coloured glass roof and aluminum skin. The structure is also fitted with photovoltaic shutters to generate electricity and light merchant stalls using LED technology. Outdated school facilities and classroom relocalization initiatives are commonplace in regions across Québec. 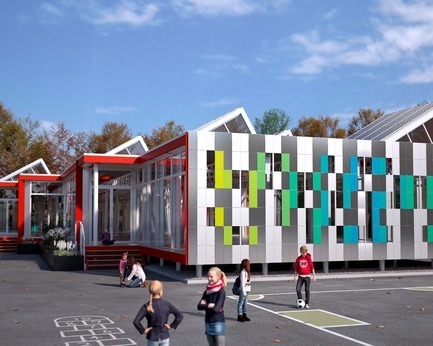 The project dubbed School in Motion by the firm of Luc Plante Architecture + Design – Charles Godbout, Topo Design (Luc Plante, Charles Godbout), a juxtaposition of prefabricated aluminum modules each measuring 118 square metres in area, proposes an exciting alternative to temporary school buildings. Fully mobile and easy to erect and dismantle, these open concept spaces feature quality light, ventilation and acoustics, as well as layout versatility to provide for a healthful, dynamic environment for students. 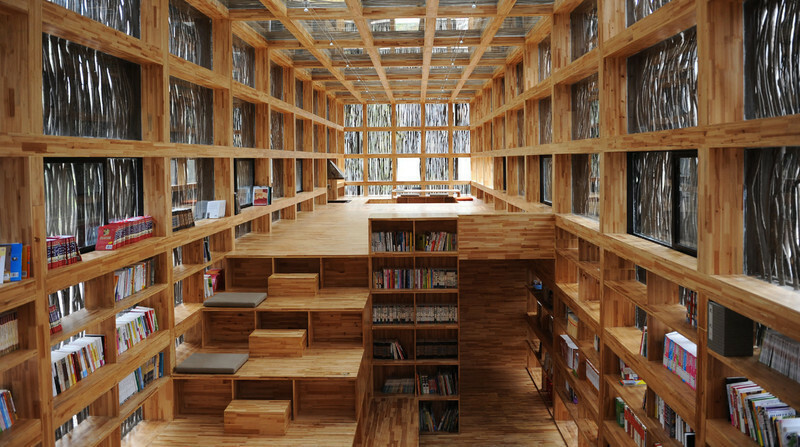 Requiring no excavated foundation, these new learning spaces comprise load bearing frames measuring 2.4 metres by 2.4 metres laid out in succession to form floors and ceilings which are supported by a series of columns and beams. Modules can be set up on land adjacent to buildings undergoing renovation or neighbouring lots. Inspired by Inuit igloos and designed for cold weather, Lollypop units, developed by Antonio Camara of the firm Provencher Roy, are intended as emergency or leisure community shelters. Comprising 36 skin modules and two aluminum shells supported by a trellis structure, the units are particularly pleasing to the eye. 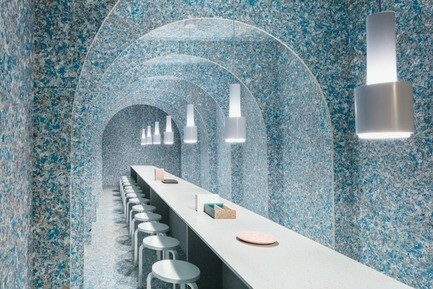 In concrete terms, they feature a modern-day take on igloo ventilation principles. Heat is generated by the heated sheets of aluminum beneath the floor, with ventilation made possible by the presence of a roof-level oculus providing for a maximum of natural light. 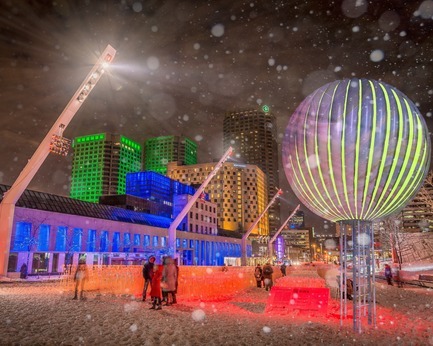 The simplicity of deploying the light, flexible Lollypop system makes it possible to set up in spaces covered with snow. In short, prospect of warmth on a cold -40°C winter night and beacon of light for urban strollers. The primary thrust behind Sans détour, a creation of ADHOC Architectes (Jean-François St-Onge, François Martineau, Tania Paula Garza and Pascale Bornais-Lamothe) is to link two worlds, two communities with much to share, namely vibrantly urban Verdun and serenely suburban Île des Sœurs. How? By erecting a bridge, literally. 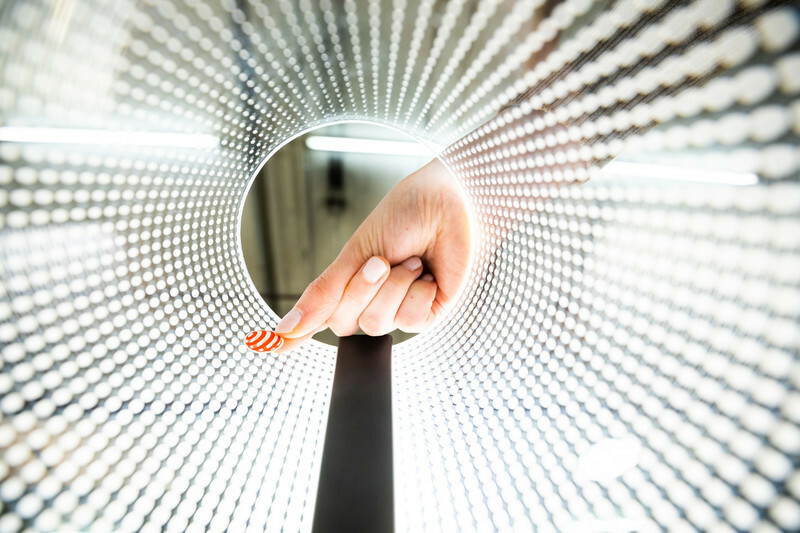 Constructed entirely of aluminum, the bridge would present a changing portrait based on the time of day. Golden and translucent at sunset, the bridge would appear decidedly more opaque with the sun high in the sky at midday. The project entails a helicoidal staircase descending to the water as well as panoramic overlooks, the object being to provide a means of bringing together residents living on opposite sides of the river. Centre d’expertise sur l’aluminium (CeAl) is a centre dedicated to the documentation, development and sharing of information about aluminum. The CeAl vision is to provide a credible, well-known, recognized source of information and technical references for individuals wishing to make greater use of aluminum. The Centre’s mission is to compile, produce and share available knowledge pertaining to aluminum processing. The CeAl mandate is to encourage and facilitate the use of aluminum through technical support, training, referencing and promotion. 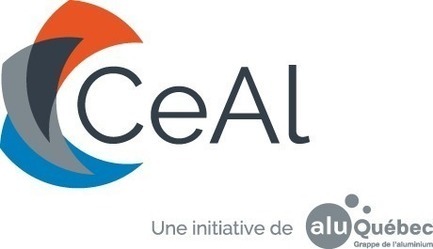 CeAl is an initiative of AluQuébec (the aluminum industrial cluster) inspired by Measure No 14 on sharing aluminum expertise set out in the 2015–2025 Québec Aluminum Development Strategy. For more information: CeAl-aluquebec.com. In Québec, Alcoa Innovation is a partnership set up in 2008 together with Industrial Research Centre of Québec (CRIQ) and Aluminum Research and Development Centre of Québec (CQRDA) to structure and sustain the development of the aluminum industry and markets. The twofold mission of Alcoa Innovation is to support small- and medium-sized Québec enterprises (SMEs) active in the aluminum sector by fostering the development of innovative products made of processed aluminum, and to promote the use of aluminum in technological as well as sustainable development initiatives. In 2012, Alcoa Innovation launched a newsletter dubbed INNOVER to weave closer ties with public and industrial decision makers.